Candy Bars are made from many ingredients which can be grown and manufactured from all around the world. You need to find where some of the ingredients for your candy bar might have come from. You will enter information onto the spreadsheet located in Google Classroom. Once the spreadsheet is complete you will create a Google MyMap with the information. 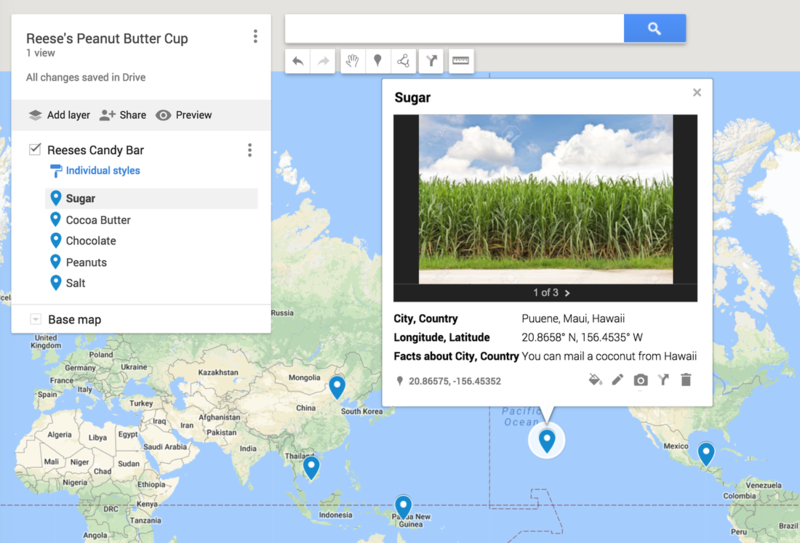 Complete a Google Search finding location using Longitude and Latitude information. Open a Google Sheet and add information collected. You first need to find the name of the City and Country that are indicated on your worksheet for each ingredient. You first need to find the name of the City and Country that are indicated on your worksheet for each ingredient. You also need to decipher the name of your candy bar. Open Google Sheet (located in Google Classroom). Re-name to the name of your candy bar. Enter data from your worksheet onto the Google Sheet. Find one fun fact about the city/town. Import your map: City, Country then enter Ingredient. For each place marker, add three (3) images. Images MUST include the ingredient and the city/town. When done, click share, copy the link into Google Classroom.